Lewis Dabney Crenshaw, Paris 1918, courtesy UVA Special Collections. On an airplane flight yesterday that had (extremely slow) WiFi, I did a little research and came across some more information about Lewis D. Crenshaw, the UVa alum who co-authored the football song “Hike, Virginia” and put together the first modern UVa reunions in 1914. I remain awed by his tireless energy as UVA Alumni Association Secretary, particularly by his work as the director of the University’s European Bureau during World War I. But I hadn’t fully appreciated his student involvement. In a career that included a law degree, he was at one time or another a member of Delta Tau Delta, Phi Delta Phi, Lambda Pi, the O.W.L., P.K., the Raven Society, vice-president of the Arcadians, on the board of the Athletic Association, and King of the Hot Feet. One of their more raucous nighttime performances consisted of removing the stuffed animals, snakes, and other varmints from the Cabell Hall basement, where they were stored, and stationing them behind the professors’ classroom desks and in front of their residences on the Lawn. This assemblage, which included a kangaroo, a tiger, an ostrich, a moose, boa constrictor, threetoed emu, and other animals, fowls, and reptiles, greeted the dumbfounded citizenry on Easter Sunday morning. On top of this, some well-lubricated Hot Feet bulled their way into a student’s room, roughed him up, and carried off a beer stein. But at the time of Crenshaw’s Kingship, the Hot Feet were known mostly for their elaborate public coronations, costumes, and their public singing. Bringing it back to the Glee Club, the tune of their “Hot Feet Song” is the tune to the football song “Hike, Virginia”—unsurprising, given that both Crenshaw and his co-author Charles S. McVeigh were Hot Feet! 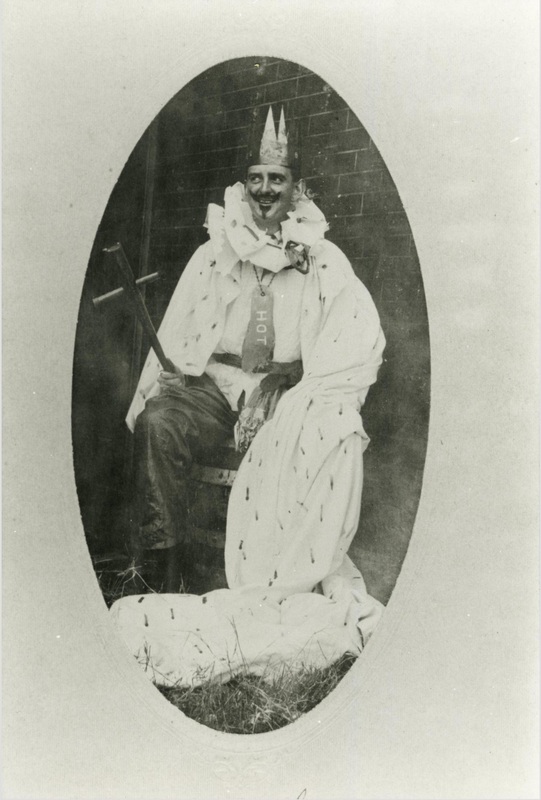 I close with an image of Crenshaw in full “King of the Hot Feet” regalia, presumably dating from long after his Kingship. I will say this: whatever the mischief that the Hot Feet got into, it looks like they had a hell of a lot of fun. It’s hard to write something every day. That should be a self evident statement, but based on my track record fifteen years ago, I blithely assumed it would be easy to get back on the horse after a multi-year hiatus. It’s not. One of the things I used to be able to do was to keep a thread always running in my mind, thinking about the next thing I was going to write about. The problem is that it’s hard to avoid writing the same stuff over and over again—or worse, to avoid writing about stuff you don’t want to write about. For me, right now, that includes the 2016 presidential race, which I find appalling, and the Apple/FBI argument, which I find appalling for different reasons. It might be time to start a new topic on this blog so I don’t continue spinning my wheels on the same old ones. Cocktails, maybe. Or existentialism. 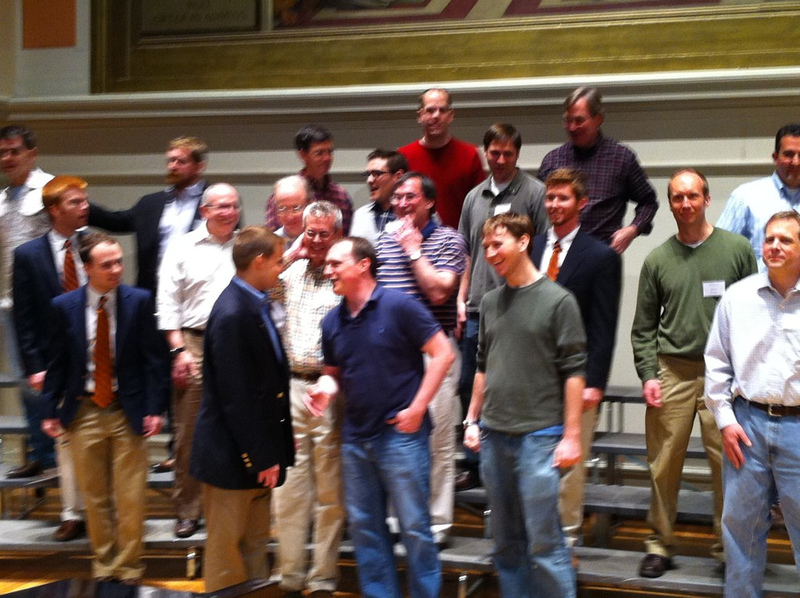 We’re in the run-up to the Virginia Glee Club 145th Anniversary Reunion, and that has me thinking about the history of Glee Club reunions. In the afternoon came the Alumni dinner whereat many of the young initiates forgot themselves and waxed uproarious–especially to be noticed was a sober minded one who insisted on drinking to the health of the “Glee Club” after every song in which performances his stentorian lungs did effective service. So before there were Glee Club reunions, there were alumni at University functions who were involved with the Glee Club. The next reunion was likely the 50th Anniversary concert in 1936. I say “likely” because we don’t have a record of an actual reunion event, but we do have evidence that there was going to be, thanks to the listing of the Glee Club’s Alumni Advisory Board in the 1935 Annual Concert program. After that the record is murky. The next one for which we have a record is the 125th Anniversary in 1996 (in between these two we changed the founding date from 1886 to 1871 based on better evidence). This established the format for future reunions: a Glee Club performance, an alumni sing, a banquet. Regular five year reunions began in 2006 with the establishment of the Virginia Glee Club Alumni and Friends Association and the 135th anniversary. Reunions have followed at five year intervals since then. If you haven’t done so, it’s fun to check out the photos, video, and audio from the 140th. 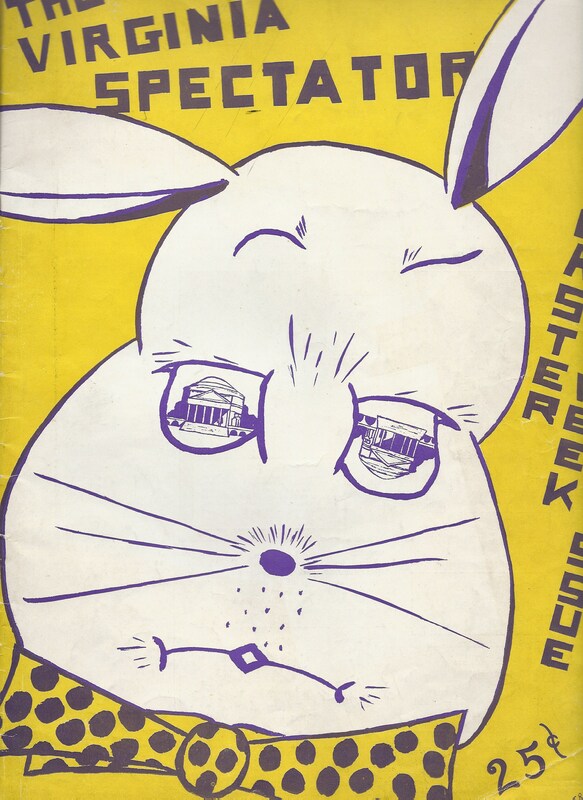 I had a lucky eBay find last week: a copy of the April 1938 issue of the Virginia Spectator, the successor to the University of Virginia Magazine and the original University of Virginia literary mag. These magazines aren’t especially valuable, though they only turn up infrequently. What made this one stand out was an article by a Virginia Glee Club member, Daniel Jenkins, about the state of song at the University. Jenkins is an alum I’ve known about for some time. When I was an undergrad, he sent us a letter about his experience as a Glee Club member in the 1930s. I subsequently discovered that he had been a member of the Tin Can Quartet (which I wrote about a while ago) He is, I believe, still with us and still supporting the Glee Club’s endeavors, though I don’t know much about his whereabouts. On Saturday nights of Finals, however, a minor miracle took place. Gathered in and around a certain room on East Lawn were a goodly number of dark conspirators; six members of the class of 1912 had slipped away from their comrades, bearing with them a huge Mason jar containing a mint julep, and were on their way to join the group lurking in the shadows of East Lawn. Three members of the Tin Can Quartet, a dozen members of the Glee Club, past and present, and an odd assortment of dates waited expectantly as the six alumni approached. 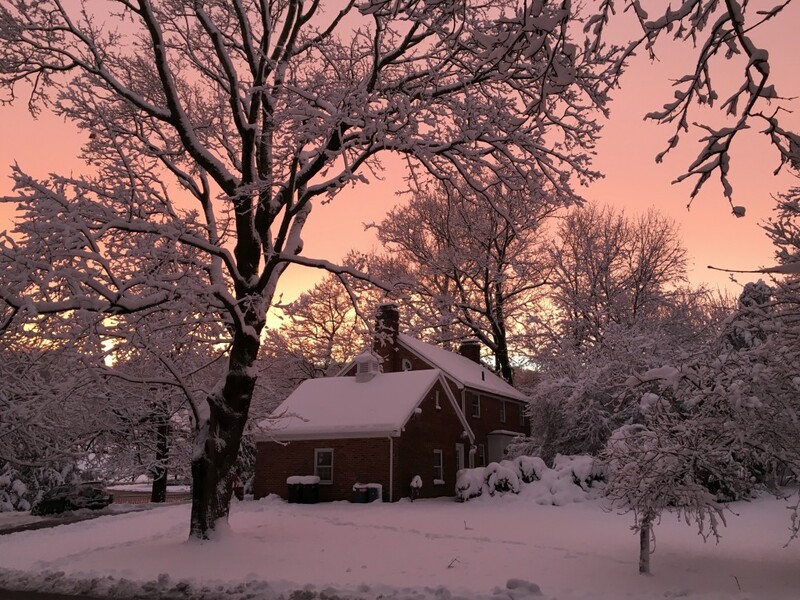 And then, a short five minutes later—ah, shades of the mighty Caruso!—it had been a long year—the soft, harmonious tones of “Sweet Adeline” once again rolled up and down the Lawn. The same moon shimmered through the trees and the same purple shadows mingled with the ghostly figures that stood grouped beneath a stately oak. A prominent and dignified New York attorney gazed up at the stars and hit notes of which he had never before believed himself capable. A notorious “big business man” drowned the sorrows of a troubled world in his Mason jar and gazed down at the green sod beneath his feet, rumbling a potent bass that seemed to mingle with the very roots of the mighty oak which towered above him. For three hours the singing continued. They sang every song that ever graced a barbershop of old. Juleps were plentiful and so were first tenors—happy coincidence. But finally, at four o’clock in the morning, and when voices were so hoarse that anything above a whisper was an effort, the small crowd began to break up. The six alumni, their eyes tired but shining, stumbled wearily across the Lawn, speaking in reverent tones of the song-fests that used to be so common and now are so rare. The others, lingering for a brief moment over the dregs, said good-night and went their separate ways. The Lawn was once again cloaked in silence. I was unsurprised, but a little disappointed, to find that even this memory carried the taint of the South’s original sin, though, with the inclusion of the minstrel show song “In the Evening, By the Moonlight.” Again, a reminder that the Glee Club was like every Southern cultural institution and carried the seeds of slavery’s past with it into the twentieth century. But the article gives me hope, too, that the power of song can still bridge generations and tap deeper reserves of humanity in the singer and the listener. It’s a timely reminder, given the Glee Club’s upcoming 145th Reunion celebration in April. I hope the juleps are plentiful then too. We spent most of our first day in Magic Kingdom yesterday around Main Street, Fantasyland and Tomorrowland (with a brief detour into the outskirts of Liberty Square for some funnel cake). But with a late afternoon case of the sore feet and aggravated from one more too-scary roller coaster (yes, my 5 year old son is officially Too Little for roller coasters if he can even be scared by the Seven Dwarfs Mine Train), we hopped on the train and rode it all the way to Frontierland. It was like being dropped off in a different century. The whole aesthetic of Frontierland seems tied to the same decade that brought us the Berenstain Bears — a nuclear family where the mama wears a bonnet and dad wears overalls and they live in a wood paneled country cabin style tree house. Which is to say, I walked through and instantly felt as though I were back in 1981 during my first visit to the Magic Kingdom. I even had a powerful flash of déjà vu walking from Frontierland into Adventureland. I knew that stretch of Old West street. I had walked it. I had gone to the Country Bears Jamboree in it. The fact that going around the corner brought you to Aladdin’s Magic Carpet (and a character meet and greet with Jasmine) didn’t dislodge my memories—these attractions sit cheek by jowl next to the Enchanted Tiki Room and still are around the corner from the Swiss Family Robinson Treehouse. If Tomorrowland has received a big grafting of 21st century product, Tomorrowland and Adventureland felt something like 90% pristine. Which is interesting to me. I think the original theory of these two lands was that they would be the “boy” lands while Fantasyland and Main Street would be the “girl” lands. But today’s kids have never heard the theme song to “Davy Crockett” (which was, to my surprise, playing on the bus to the park yesterday morning). There are no free range outdoorsman or cowboy kids any more. So what explains the enduring power of these attractions? I guess the difference between Tomorrowland and Frontierland is that, when it was built, we still thought that there was more Tomorrow to be discovered. But the frontier celebrated by Frontierland had been largely explored a hundred years before Disney got to it. Frontierland was nostalgia from the beginning, grown into archetype, and now all but into myth. This is my second trip to Walt Disney World. The first was in 1981. Back then my dad and I went on the then new Space Mountain—my sister tried it only to bail out at the last minute. The next day, we went to Cape Canaveral and watched the first launch of the shuttle Columbia. Now it’s 2016. This time I’m the Dad and it’s my daughter (and the rest of my family) who opted out of Space Mountain. And the space shuttles haven’t flown for years. Columbia itself was destroyed in 2003. Walking through Space Mountain, the time seems even more out of joint. FastPass is a brilliant innovation: there are no lines, provided you go when you’re told and don’t mind planning months in advance. Disney discriminates in favor of the intentional and the planful—no place for the ADD-afflicted in this kingdom! Once through it mostly seems dark, and even the refreshed interior seems dated. And either I remember more lights inside the actual coaster or I’ve gone blind. Tomorrowland, the part of Disney World that Space Mountain anchors, doesn’t look much like tomorrow any more. Big parts of it consume a pre-mid century aesthetic of Flash Gordon and Googie California gas stations. But this future never came to be. And the bits that have started to come in around the edges—Monsters Inc?—don’t seem like a future at all. I don’t know what our future looks like but I don’t think it’s space travel. But when I was a kid that’s all I thought about. What will my kids imagine for their future? 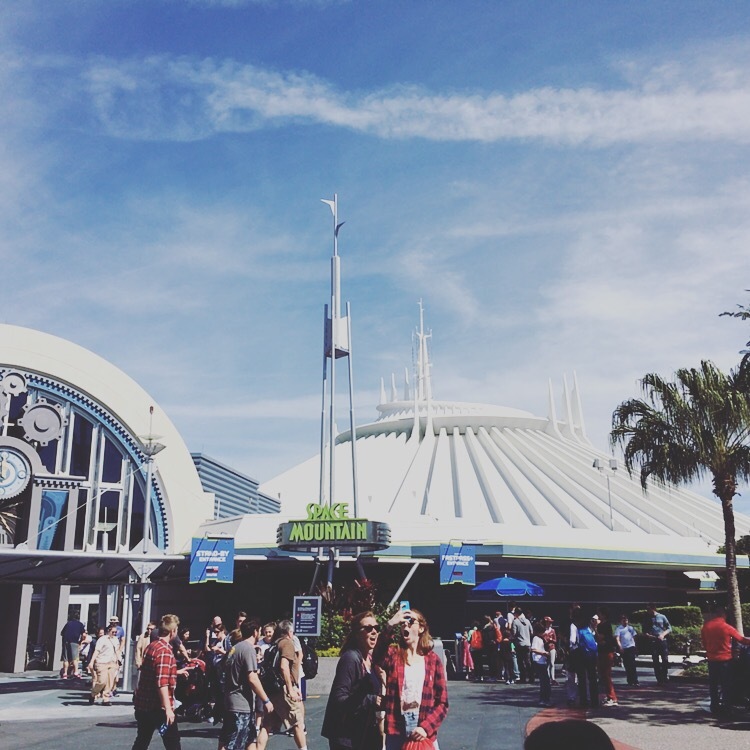 Yesterday was our first day in the Magic Kingdom’s parks, and of course I didn’t blog. One of the things this exercise in daily blogging has taught me is the importance of carving out time to write, which is impossible when sharing a room with three other humans, two under the age of 10. So I’m writing this while the kids bounce off the walls. Timely breakfast is important for everyone’s happiness. The five year old was not ready for Expedition: Everest or for the time traveling Dinosaur ride. Neither was his nine year old sister. Or his mom. In fact, I’m probably the only scary ride aficionado in the family. Even a nine year old gets tired of chicken nuggets. That doesn’t make her want to try new foods though. It’s nothing short of a miracle to find good beer in a big amusement park. Thank you, Victory Golden Monkey. It’ll be interesting to see what today brings. Glee Club history: Edward Addison Craighill Jr.
I’ve written a few times about one of the Virginia Glee Club’s more notable alumni, Edward Addison Craighill, Jr., who is principally credited with the authorship of the “Good Old Song,” the de facto alma mater song of the University of Virginia. But I thought it might be worth looking at his life beyond this song. Craighill was born in 1873 in Lynchburg, Virginia. His namesake, his uncle, surgeon Edward Addison Craighill, had been at age 17 the youngest doctor to serve in the Medical Department of the Confederate Army, and wrote a memoir of his experiences. 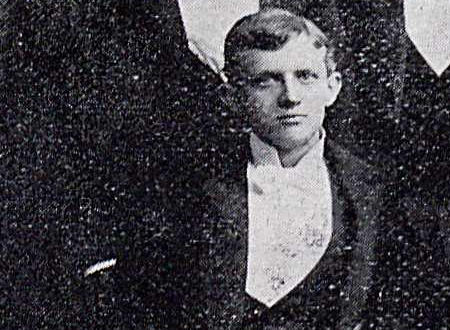 Craighill entered the University of Virginia to study law in 1892, and was there to greet the football team in the fall of 1893 as they returned triumphant from a victory. Out of the crowd came what is now the first verse of “The Good Old Song.” Craighill subsequently wrote a second and, for an alumni banquet in 1910, a third verse for the song. But in a 1922 article in the University of Virginia Magazine, he disclaimed authorship of the first stanza, noting that “no one man should be credited with the authorship.” During his time at Virginia he was a member of the Virginia Glee Club and participated in the 1894 tour. 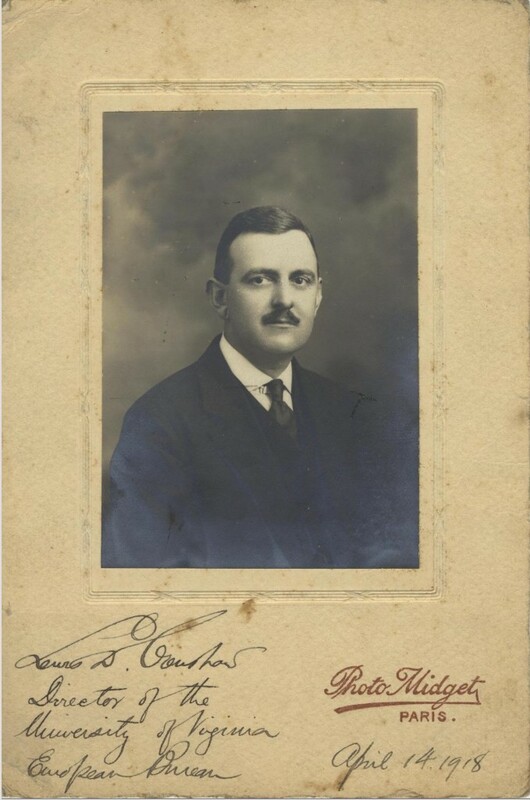 Craighill graduated in 1895 from the Academic Department and finished his law degree in 1896, gaining employment as a writer for a law encyclopedia before joining the firm of Fletcher, McCutcheon and Brown in New York. He died in 1948. I think there’s something touching about Craighill’s insistence, 30 years after the debut of the song, that he deserved no credit for the “Good Old Song.” It’s not clear that, after the 1922 article, he was included in alumni outreach. He’s not mentioned in a 1935 “Alumni Advisory Board” that included other past presidents and luminaries of the group, for instance. But his name remains one of the most cited in Glee Club programs, and I believe he deserves more credit than he gave himself for the song. After all, in the drunken crowd that came up with “it cheers our hearts and warms our blood to hear them shout and roar,” someone had to remember the words well enough to write them down. Author Tim JarrettPosted on February 11, 2016 Categories VirginiaTags uva, virginiagleeclubLeave a comment on Glee Club history: Edward Addison Craighill Jr.
Back in the day before Facebook, we had to have multiple services for posts and pictures. I ultimately became a Flickr customer, but not without some wringing of hands about putting my photos in the service of another company. These days, that concern seems incredibly naïve, considering how much of my writing and photography is currently behind locked walls at Facebook. Part of what I’m going to do with this new daily writing project is liberate some of the more interesting stuff that I’ve put into their walled garden and make it available on my blog, and on Flickr. I still have concerns about Flickr (especially in these days of angst for Yahoo, its parent), but it’s the best photo hosting service, hands down. I just posted 20 new photos to my photostream, starting here. Go check them out! Boston Globe: MIT researchers find new ways into brain’s “music room.” The research by MIT’s Sam Norman-Haignere, Nancy Kanwisher, and Josh McDermott sounds straightforward: apply clustering to patterns of nerve activation to find the cells that respond to music. Turns out it’s a radical new approach that bridges magnetic resonance imaging and “machine learning,” or categories of math on sets that identify groups that are similar to each other. I’d love to see the follow-on that evaluates these activation pathways in trained musicians vs. lay listeners. Note: A more complete version of the article appeared in the New York Times.